The painting “Wolf” was created after a very difficult period in the life of Jackson Pollock. The artist suffered from alcohol dependence and was forced to undergo a course of treatment in a psychiatric hospital. 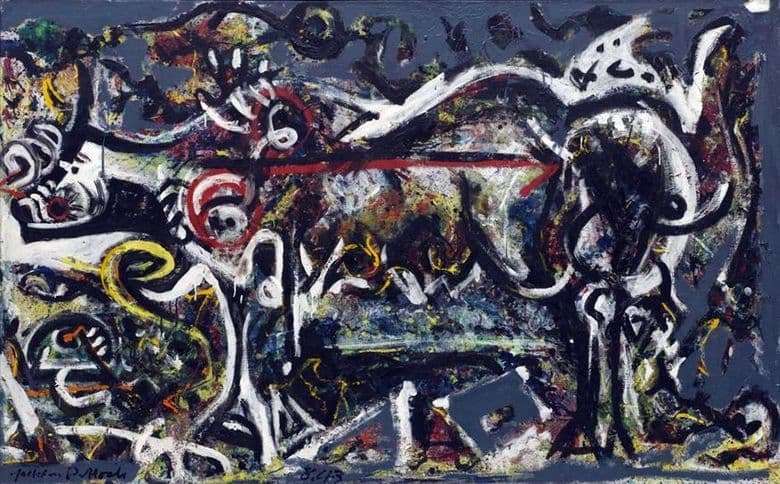 After that, Pollock begins to paint in a very complicated style of surrealism and abstractionism, which we see when looking at his work The Wolf. The artist drew the idea for his creation from Native American mythology, which completely fascinated him and plunged into the world of mysticism and mysterious signs. For the first time the presentation of the picture was on the Jackson Pollock exhibition in 1943. A significant mass of people considered the plot from the legend of two brothers who founded Rome, Romulus and Remus, who were fed by a she-wolf. The author declined to comment on this assumption, relying on the fact that he simply had to create this work. The absence of any rational explanation of the main meaning of the picture on the part of its creator has enveloped Wolf more and more with mysterious mysticism. A she-wolf is a kind of female spiritual power, praised in ancient mythology. Jackson Pollock, using coarse strokes of contrasting black and white paint, communicates to the viewer this power in the look of the she-wolf, who intently watches us from the canvas. One can also notice the many present ancient hieroglyphs, highlighted by bright shades of paint, which are scattered throughout the picture and inspire special feelings of primitiveness. Looking at the picture “Wolf” it is impossible not to think about the natural force surrounding us. The artist created a truly mystical and mysterious creation, without revealing the main secret, what he was trying to bring this picture. However, this inexplicability, made the “Wolf” one of the most popular masterpieces of the author, to which I want to return again and again.